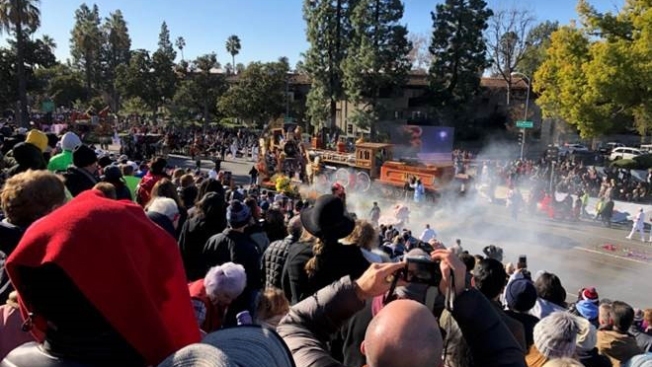 While the Rose Parade had many high notes, it also had a bit of a scare when a float caught on fire New Year's Day. Amid the merriment, the "Harmony Through Union" caught fire and began smoking before 10 a.m. PT. It was taken off the parade route for the remainder of the spectacle. No one appeared to be injured in the small blaze. 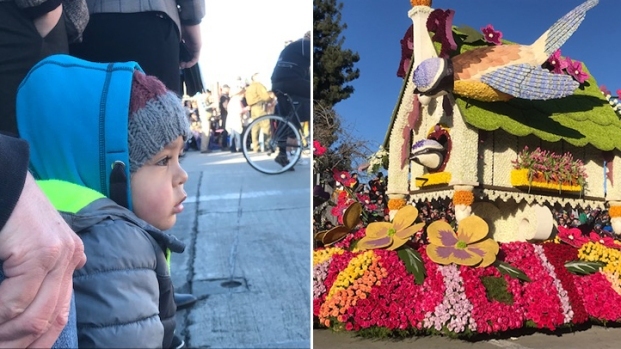 The official Rose Parade Twitter account said the float experienced the "technical difficulties" at Orange Grove and Colorado boulevards. The Tournament of Roses issued a statement about the delay: "Public safety is a top priority for the Pasadena Tournament of Roses Association. The temporary delay of the 2019 Rose Parade was promptly addressed by our operations and public safety partners. Thank you for your patience as we gather more information." The rest of the Rose Parade got on without a hitch, and even saw some firsts. Grand Marshal and 10-time Grammy Award Winner Chaka Khan entertained along with her grandchildren with a medley of her hits in a collaboration seen for the first time in its 130-year history. The 65-year-old singer known for hits including "I Feel for You," "Through the Fire" and "This is My Night" was chosen to align with the parade's theme, "The Melody of Life.'" Get information on street closures and more here. Tournament of Roses President Gerald Freeny said the theme has universal appeal, since music touches the lives of people around the world. "On a personal scale, it gets us through our day, it accompanies us through good times and bad times,'' Freeny said. "It is quite literally the soundtrack of our lives. But on a grand scale, it has the ability to heal, to unite, to promote change, to bring joy and harmony and rhythm and happiness. The 5 1/2-mile Rose Parade started at 8 a.m. PT, beginning with an "Opening Spectacular'' performance featuring Khan, "Dancing with the Stars'' champion Jordan Fisher and hundreds of dancers, including the HTEDance & Spirit Group from Irving, Texas, and The Boys of Temecula dance company. The parade's closing ceremony featured pop singer Anne-Marie. The parade itself featured 40 floral-covered floats, 18 equestrian groups and 20 marching bands from across the country and around the world, including bands from Japan, Sweden, Costa Rica and Canada. The marching bands from the University of Washington and Ohio State University — the teams competing in the afternoon's Rose Bowl Game — also took part in the parade. -- Helen Susan Rossi, a Flintridge Preparatory School senior and La Canada Flintridge resident. The stars of the parade, however, are the brightly colored, animated floats — all covered from top to bottom with flowers or other organic materials. As usual, this year's parade featured floats sponsored by some Southland cities, including Alhambra, Burbank, Downey, La Canada Flintridge and Torrance, along with groups and businesses such as 24 Hour Fitness, Honda, Carnival Cruise Line, Chipotle, Kaiser Permanente, Northwestern Mutual, Shriners Hospital for Children and Trader Joe's. Universal Pictures made its debut as a float sponsor, teaming up with DreamWorks Animation to present a float heralding the upcoming animated film "How to Train Your Dragon: The Hidden World.'' The float featured a floral-covered, fire-breathing dragon. Stella Rosa Wines made its second-ever Rose Parade appearance with a "Taste the Magic'' float, which was ridden by the Grammy-winning band Kool & the Gang, in a nod to the parade's Melody of Life theme. They rocked the house with hits "Celebration," and more. When the parade concluded, the floats were to be on display from 1 p.m. to 5 p.m. Tuesday and 9 a.m. to 5 p.m. Wednesday during the Showcase of Floats at Sierra Madre and Washington Boulevards. The last entry is 4 p.m. on both days.